Father Leonard Edward Feeney (Lynn, Massachusetts February 18, 1897 – Ayer, Massachusetts January 30, 1978) was an American Catholic priest, belonging to the Society of Jesus who is best known for his resistance to liberalism and defending the Catholic doctrine of extra Ecclesiam nulla salus ("outside the Church there is no salvation"), arguing that baptism of blood and baptism of desire are unavailing of the graces of water baptism, and that no one can be saved without belonging to the Catholic Church and personal submission to the Pope. He fought the Modernist agenda which spread through the world following the Second Vatican Council. 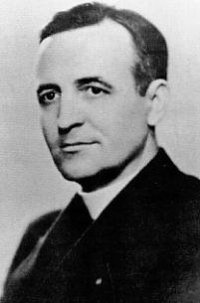 Feeneyism is the doctrinal position held by Feeneyites (and true Catholics) associated with Leonard Feeney (1897–1978), a Jesuit priest and founder of the Slaves of the Immaculate Heart of Mary, who advocated a strict (and correct) Catholic interpretation of the doctrine extra Ecclesiam nulla salus ("outside the Church there is no salvation"). Fr. Leonard Feeney was officially “excommunicated” in 1953 by “The Supreme Sacred Congregation of the Holy Office” under Pope Pius XII for refusing to submit to ecclesiastical authority, but his supporters claim that the excommunication was invalid because the correct procedure was not followed and the reason for excommunicating him was not in accordance to divine Catholic faith or justice. He was reconciled to the Vatican II Church before his death, but was allegedly not required to retract his position on the doctrine in question, which is inscribed on his tombstone. - He promoted Annibale Bugnini, the author of the New Mass, and began the liturgical reform with his allowance of reforms in the Holy Week Rites. - He promoted men like Giovanni Montini (later Paul VI) and Angelo Roncalli (later John XXIII), without which promotions these men could never have had the influence or caused the immeasurable destruction that they did. - He taught that birth control could be used by couples by means of the rhythm method (or Natural Family Planning), which is a frustration and a subordination of the primary purpose of the marriage act – procreation. - He allowed the persecution and subsequent excommunication of Father Leonard Feeney, whether through willful complicity, ignorance or neglect, for doing what every Catholic priest should do: preach the Gospel, defend the faith and adhere to defined dogma. This really shows the ignorance of these men. When Father Feeney was “excommunicated,” absolutely nothing was stated that the “excommunication” was for a belief he held. But that doesn’t matter to apostates like these men, because they are evil. It’s also interesting to note that heretics like this, who do not believe one bit in the necessity of Jesus Christ or the Catholic faith, are major proponents of “baptism of desire” and the “excommunication” of Fr. Feeney. That’s quite revealing about the forces behind those two ideas. In 1972 Father Feeney was supposedly “reconciled” to what he thought was the Catholic Church (in reality it was the Vatican II sect). If Father Feeney truly needed to be reconciled, he would have had to recant any possible erroneous or heretical positions. Yet, he was never asked to do that. Anyone who is truly excommunicated for heresy must withdraw what they once held and proclaim belief in orthodoxy. But Father Feeney was never asked to take back or repent from his teaching on “Outside the Catholic Church there is no salvation.” Why not? Because those of the Archdiocesan establishment who arranged for the reconciliation knew the facts of the case and that Father Feeney was not “excommunicated” for heresy, but for disciplinary reasons. But for the pre- and post- Vatican II heretics who condemned and still condemns the staunch priest Father Leonard Feeney, and despised and still despise the dogma Outside the Catholic Church there is no salvation, and sowed and still sows the seeds for the Great Apostasy that is now upon us – for them it is no problem believing that there is salvation outside the Catholic Church, while simultaneously pretending to believe that there is no salvation outside the Catholic Church. It is no problem for these people because they are of evil (Mt. 5:37). Therefore, Father Leonard Feeney was not “excommunicated” for teaching that outside the Catholic Church and without submission to the Roman Pontiff no one can be saved. He couldn’t be, because the Church herself has dogmatically defined this. The Sacrament of Baptism is necessary for salvation (Pope Benedict XIV: Denz. 1470) for adults and for children alike (Vienne: Ddnz. 482; ), and is optional for NO ONE (Trent: Denz. 861; ). The facts presented in this article need to be made known so that the good name of Father Leonard Feeney, M.I.C.M., can be restored among Catholics and the immutable dogma of no salvation outside the Catholic Church be once again proclaimed from the housetops that the Vatican II sect can be opposed and condemned by everyone as the heretical and apostate end times church that it really is. Was Fr. Leonard Feeney a Heretic? Fr. Feeney remained in religious communion with the heretics who denied the Salvation Dogma. He prayed with them and allowed others to attend their Masses. And before he died in 1978, he formally entered into religious communion with the salvation heretics by abjuring before them by making a profession of faith. The reason Fr. Feeney cannot yet be denounced as a formal heretic is because we do not know that he ever was an obstinate heretic, that he had read the Second Vatican Council’s documents, that he ever agreed with any heresy, or had access to or were aware of the other heresies committed by the apostate Vatican II antipopes, or was aware of the teaching that a public formal heretic cannot be pope. And we do not know what catechism he used in his churches. We do not know for certain that heresy was taught in the churches under his control, or, if heresy was taught in his churches, we do not know if he himself ever approved of such heresies being taught or that he ever agreed with it being taught. This is not the case of the current-day Saint Benedict Centers and the Slaves of the Immaculate Heart of Mary because it is known that they have access to the heresies of the Vatican II Church and its antipopes and the teaching that a public formal heretic cannot be pope and yet they explicitly say there is no heresy in the Second Vatican Council and that the apostate antipopes do not teach heresy and they even explicitly teach that the Second Vatican Council is a “true ecumenical council” and that the Vatican II popes are true and “validly elected popes who retained their pontifical offices.” And they deny the solemn and the ordinary magisterium dogma that public formal heretics cannot hold offices in the Catholic Church. Notice that they hold that Vatican II was a legitimate council of the Catholic Church and that they claim to have no right to say that Vatican II taught heresy! The statement that the New Mass has the sufficient form of consecration is a lie, but that’s not what I want to focus on here. Notice that they hold that one cannot be forbidden to attend the New Mass! Thus they are to be considered formal heretical sects that fully recognize and approve as “ecumenical” and “binding” the heretical Vatican II documents and hence officially recognize heresies as no heresies and formal heretics and apostates as true popes or ecclesiastics, and hence all their followers must likewise be presumed to be formal heretics, even though there is a small possibility that some people attending these churches may be material heretics and unaware of the heresies rampant in the Vatican II sect. Whoever does not denounce as formal heretics the Vatican II claimants like John Paul II as an outright apostate, blasphemer, and heretic, and condemn his crimes for what they are when they are aware of his crimes, is guilty by sins of omission; and many, in order to defend the crimes, will eventually explicitly profess heresy, whether or not they are aware of it. Well, this has happened with Br. Francis Maluf of the St. Benedicts Center in New Hampshire. A certain person, William G. Norris, called Br. Francis on February 12, 2003, 4:00-4:24 pm MST. In this conversation, Br. Francis Maluf, the superior of the Saint Benedict Center in New Hampshire, admitted to believing in the Vatican II heresy that Muslims believe in and worship the true God. So, there you have it. Br. Francis told William that Muslims believe in and worship the true God (he never denied that they worship the true God and even went on to affirm that they “believe in God”) and implies they never heard of Jesus Christ and the Most Holy Trinity. Jesus already revealed to the world that He and the Most Holy Trinity is God; most Muslims not only know it from reading the Koran, but they also explicitly deny that Jesus and the Most Holy Trinity is God by adhering to the heretical teachings found in their religious book, the Koran. Nevertheless, Br. Francis has the audacity to say that, “When Muslims say Allah, they mean God” and that, “Allah means God. They are referring to God that made heaven and earth.” No. When Muslims say “Allah” they are not thinking of or referring to the most Holy Trinity or Jesus Christ who made heaven and earth, hence that they cannot and are not referring to the true God that made heaven and earth since they explicitly reject Jesus Christ and the Trinity. So when Muslims say “Allah,” they are not referring to God, but are referring to their own “God,” the so-called God of the Koran, and this “God” – or rather, Satan – rejects the Trinity and denies the Son. Br. Francis cannot have it both ways. He cannot truthfully say that Jesus is God while saying Muslims, who deny that Jesus is God, also believe in God. That is mixing the sacred with the profane (syncretism). It is speaking with a double tongue and double heart. Br. Francis has also watered down John Paul II’s crime of kissing the Koran by only referring to it as scandal. It is much more than just scandal. It is apostasy and idolatry. It is a denial of Jesus Christ and the Most Holy Trinity. The Koran is the Muslims’ “holy” book which blasphemes the Most Holy Trinity and denies the Divinity of Jesus Christ. To revere the holy book of a false religion has always been considered an act of apostasy – a complete rejection of the true religion. John Paul II did the equivalent of worshipping at the tomb of Mahomet when he kissed the blasphemous Koran, when he praised Islam and its leaders countless times, and when he attended the mosque. Just imagine what the Catholic saints would say about the Vatican II sect and John Paul II? In fact, kissing the Koran is the same kind of crime that placed the early Christians outside the Church and earned them the name “lapsi” (the lapsed). Even those who broke under torture or just pretended to respect and venerate idols in order to save their lives fell outside the Catholic Church and had to abjure to re-enter Her. Heretics and modernists resist the truth, just as they resist Him who is the Truth (Jn. 14:6). And because they resist the truth they resist facts, because facts report truth without any error. One of the facts that the modernists and heretics resist most of all is the fact that the Catholic Church has infallibly taught that Outside the Catholic Church There is No Salvation and that John 3:5 is to be taken as it is written and that the Sacrament of Baptism is necessary for salvation (Trent, Sess. 7, Can. 5 on the Sacrament). So what do these people do with these facts staring them in the face? They resort to attacking the reporter of these facts (argumentum ad hominem), which enables them to ignore the facts themselves. The episode of Father Leonard Feeney, S.J. is a case in point. The dogma Outside the Catholic Church There is No Salvation really has nothing to do with Father Leonard Feeney. (In fact, I had never heard of Fr. Feeney when I came to the same conclusion – based upon Catholic dogma – that the Sacrament of Baptism is absolutely necessary for salvation and that all those who die as non-Catholics are lost.) It has to do with the teaching of the Chair of St. Peter, as has been shown, which is the authentic and infallible teaching of Christ. To reject this Catholic dogma is to reject Christ Himself. Father Feeney became famous for his public stand for the dogma Outside the Catholic Church There is No Salvation in the 1940’s and 1950’s. Most people fail to realize that, at that time, the world’s bishops were by no means staunch traditionalists. Most of the world’s bishops had already embraced the heresy of indifferentism, which explains why almost all of them signed the heretical Vatican II documents just a short time later. They had embraced the heretical idea that “invincible ignorance” saves those who die as non-Catholics. This is why one can easily detect heresy against the dogma in most theology manuals and texts beginning as early as the late 19th century. In fact, during his time, Father Feeney wrote to all of the bishops of the world about the dogma Outside the Church There is No Salvation and received only three positive responses. In other words, only three of the world’s bishops at that time manifested a positive belief in the dogma Outside the Catholic Church There is No salvation as it had been defined. It is no wonder that Vatican II went through with virtually no resistance from the Episcopate. Father Feeney believed and preached the dogma – as it had been defined – publicly in Boston. He believed and preached that unless a man embraces the Catholic Faith – whether he be a Jew, Muslim, Protestant or agnostic – he will perish forever in Hell. Many converted, and many were angry. He had not a few enemies, especially among the increasingly modernist, politically correct and compromised clergy. One of his main enemies was the “Archbishop” of Boston, Richard Cushing, a B’nai Brith (Jewish Freemasons) man of the year, and someone who called the dogma Outside the Catholic Church There is No Salvation “nonsense.” In April of 1949, Cushing silenced Fr. Feeney and interdicted St. Benedict Center (the apostolate affiliated with Fr. Feeney). The reason given by Cushing was “disobedience,” but the real reason was Father Feeney’s public stand for the dogma Outside the Catholic Church There is No Salvation. It was not due to Father Feeney’s stand against the theory of baptism of desire either, since this wasn’t first published until 1952. Cushing’s dissatisfaction with Fr. Feeney was strictly based on Father Feeney’s stand for the defined dogma that only Catholics – and those who become Catholics – can be saved. Right from the start, these fallen clergymen fused the issue with Father Feeney rather than the real source from which it came. This enabled them to focus on Father Feeney, and ignore Jesus Christ, whose doctrine this was. These heretics failed to realize that to belittle a defined dogma to something of Father Feeney’s invention is blasphemous and severely dishonest. But God is not mocked. We see the same thing today, especially rampant among so-called traditionalists. But I will return to this point. So there you have the case of Father Feeney in a nutshell. Father Feeney held, as it had been defined, that there is no salvation for those who die as non-Catholics. Those against him, including “Fr.” Keleher (President of Boston College), the “Archbishop” of Boston, the priests at Boston College, and the “theologians” at St. John’s Seminary, held a different doctrine “on the salvation of non-Catholics.” This was the battle. This was the dividing-line. One was either on one side or the other. One believed that there is no salvation for those who die as non-Catholics or one believed that there is salvation for those who die as non-Catholics. Let me quickly remind the reader on which side he will find the Catholic Church. A “Jesuit” priest of the new Vatican II religion skillfully describes what the scene was like when “the Boston Heresy Case” (i.e., whether only those who die as Catholics can be saved) erupted into public view during Holy Week 1949. One cannot help but notice Fr. Keleher’s double-tongue: these men were dismissed for ideas leading to intolerance, which could not be tolerated. If intolerance is the false doctrine here, as Fr. Keleher indicates, then he is condemned by his own mouth. Furthermore, one cannot pass over Fr. Keleher’s brazen assertion that “Their doctrine [i.e., the solemnly defined dogma that those who die as non-Catholics cannot be saved] is erroneous.” By this statement Keleher is asserting that the Church’s doctrine (on no salvation outside the Church) is erroneous and in no way his own. This was the type of heretical, anti-Catholic character in league with “Archbishop” Richard Cushing in the quest to crush Fr. Feeney’s preaching of the dogma. This was the beginning of the end, so to speak, as will be seen when we look at what has resulted in Boston as a result of their selling out of the dogma Outside the Church There is No Salvation. To fully appreciate the Father Feeney controversy one must understand that the denial of the Faith that Father Feeney was combating was well in place in the years before Vatican II. Most people considering themselves to be “traditional Catholics” have the false impression that, “if we could only go back to what people believed in the 1950’s, everything would be fine.” No, it wouldn’t. Most of the priests and bishops in the 1940’s and 1950’s had already lost the Faith and had completely rejected the solemnly defined dogma that there is no salvation outside the Catholic Church. It is simply a fact that heresy against the dogma Outside the Church There is No Salvation was being taught in most seminaries in the 1940’s and 50’s. In fact, the breakdown of the Faith began much earlier than the 1940’s or 50’s. St. Anthony Mary Claret, the only canonized saint at the First Vatican Council, had a stroke because of the false doctrines that were being proposed even then, which never made their way into the council. The step-by-step dismantling of the Catholic Faith by Lucifer began, not in 1964, but in 1864, long before Vatican II. Let’s take a look at some examples of blatant heresy in pre-Vatican II books with Imprimaturs (i.e., the approval of a bishop). But to these heretics, no longer does this dogma mean that outside the Church there is no salvation, but rather that non-Catholics are saved in their false religions but by the Catholic Church. The necessity of Catholic faith and unity for salvation has been utterly repudiated. And this proves that the dogma that those who die as non-Catholics cannot be saved was being denied publicly even as early as 1908. Here we find more clear heresy in a catechism written by the Bishop of Krishnager, Louis LaRavoire. This Catechism is still promoted today by many so-called “traditional Catholics.” By permitting prayer for departed non-Catholics, Louis LaRavoire denies the dogma that all who depart life as non-Catholics are lost. Here we find blatant heresy in the Baltimore Catechism, imprimatured and published in 1921. The authors of this heretical catechism are bold enough to assert that salvation for a non-Catholic is not only possible, but dependent upon whether the non-Catholic “firmly believes the religion he professes and practices to be the true religion.” So if you’re firmly convinced that Mormonism is the true religion, then you’ve got a good shot at salvation “provided that person (1) has been validly baptized”, according to the Baltimore Catechism; but if you’re not firmly convinced of this then your chances are less. This makes an absolute mockery of the dogma: one Lord, one faith and one baptism (Eph. 4:5). The words of Gregory XVI in Mirari Vos could have been written specifically to the authors of the Baltimore Catechism; and indeed they were addressed to other heretics in his day who proposed the same thing. Notice how far the Baltimore Catechism has come from the dogmatic Athanasian Creed, which Gregory XVI affirmed, which states that whoever wishes to be saved must hold the Catholic Faith. The authors of the Baltimore Catechism could not have, in their wildest imagination, pretended to believe in that dogmatic profession of faith. The reader should also note that Pope Gregory XVI teaches that those who have never been Catholic are lost, as well as Catholics who leave the Church. In truth, what Ludwig Ott says above is equivalent to declaring that the Blessed Virgin Mary was conceived in Original Sin. There is no difference whatsoever. If the Church defines that outside the Church no one at all is saved (Pope Innocent III, etc. ), and I assert that “those who are in point of fact outside the Catholic Church can achieve salvation,” then I am doing the exact same thing as if I were to declare that the Virgin Mary was conceived in some sin, when the Church said she had no sin. I would be stating exactly the opposite of what the Church had infallibly defined, and this is precisely what Ludwig Ott does. For the pre-Vatican II heretics who condemned Father Feeney and despised the dogma Outside the Catholic Church There is No Salvation, it is no problem believing that there is salvation outside the Catholic Church, while simultaneously believing that there is no salvation outside the Catholic Church. It is no problem for these people because they are of evil (Mt. 5:37). Those who obstinately accept the heresy that is contained in these pre-Vatican II books – such as Ludwig Ott’s Fundamentals of Catholic Dogma – should rightly fear, as Pope Gregory XVI says, because they will without a doubt inherit a place in Hell if they do not repent and convert. According to this, it’s not only possible to be saved outside the Church (which is a direct denial of the dogma), but it’s actually possible to be, “for all intents and purposes,” a member of the Catholic Church while still outside of Her! This is so heretical and contradictory that it’s not worthy of further comment, except to say that what The Catechism Explained proposes here – that a man can be saved outside the Church as long as he leads “a God-fearing life” – is exactly what Pope Gregory XVI condemned in Mirari Vos: that a man may be saved in any religion whatsoever, so long as morality is maintained. Pope Gregory XVI, Mirari Vos (# 13), Aug. 15, 1832: “This perverse opinion is spread on all sides by the fraud of the wicked who claim that it is possible to obtain the eternal salvation of the soul by the profession of any kind of religion, as long as morality is maintained… without a doubt, they will perish forever, unless they hold the Catholic faith whole and inviolate (Athanasian Creed)." I could continue with examples of pre-Vatican II imprimatured texts which contain heresy, but the point should be obvious: the denial of the dogma Outside the Catholic Church There is No Salvation was well in place in the minds of most priests and bishops before Vatican II, so the opposition Father Feeney experienced in defending this truth in the late 1940’s and 1950’s comes as no surprise. The Great Apostasy was well in place in the 1940’s and 50’s, having actually begun in the mid to late 1800’s, and Father Feeney was attempting to stifle this tide of apostasy by cutting away at its root cause: the denial of the necessity of the Catholic Church for salvation.